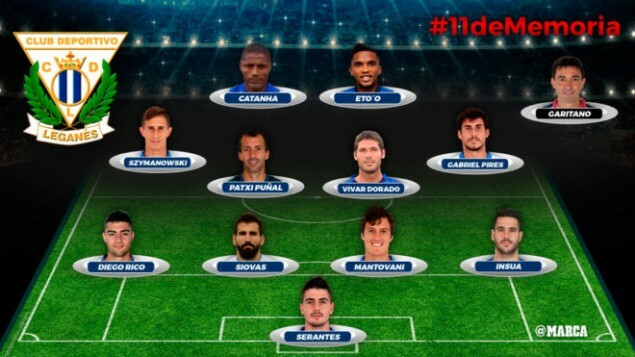 Dimitris Siovas is a modern day legend at Leganes and was recently named as one of the club’s Best XI players of all time. In a poll carried out by Spanish newspaper Marca, the Greek defender was voted by the fans to Leganes’ all-time Best XI. The list includes many of the club’s current players including Serantes, Rico, Szymanowski, Pires, and Siovas’ partner in central defense, Mantovani. The list also includes Barcelona legend, Samuel Eto’o, who played at the club back in 1997/98 on loan from Real Madrid. Dimitris Siovas joined Leganes on loan from Olympiacos last January and helped his side avoid relegation at the end of the season. Siovas’ great performances in Spain convinced the club to buy the player from Olympiacos on a permanent transfer, a decision that has surely paid off. Siovas has been a rock in the Leganes defensive line as the club sits ninth in the La Liga standings and house one of the best defenses in the league. Leganes have conceded only eight goals in their opening 11 matches, only more than Barcelona (4) and Atletico Madrid (6).